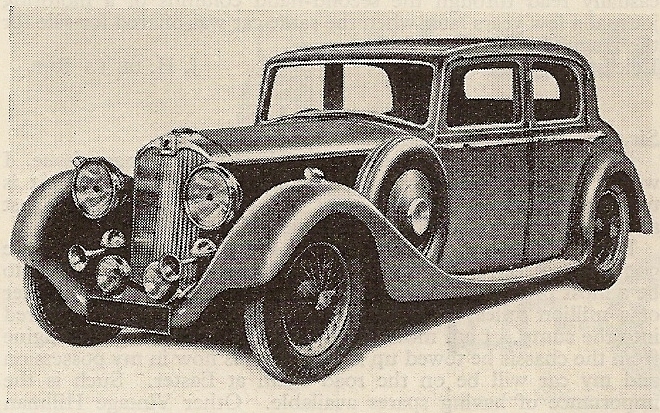 Two Autovia cars, a saloon and a limousine were previewed in 1936 with sales commencing in 1937, they were a seperate marque but ended up as a subsidary to Riley (Coventry) Ltd, like most Riley related information some of it may not be entirely accurate due to the company records being destroyed by German bombing in world war 2. The best information available suggests only 44 cars built, the survivors are thought to be 6 roadworthy, 3 complete and restorable, 2 x two seater specials, 1 rolling chassis, 1 bare chassis and 1 possible survivor in Australia. 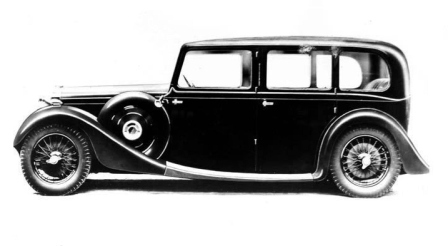 The marque was supposed to be competition to other limousine manufacturers such as Rolls Royce, using an 8 cylinder Riley V engine mounted in a very strong and therefore heavy chassis. 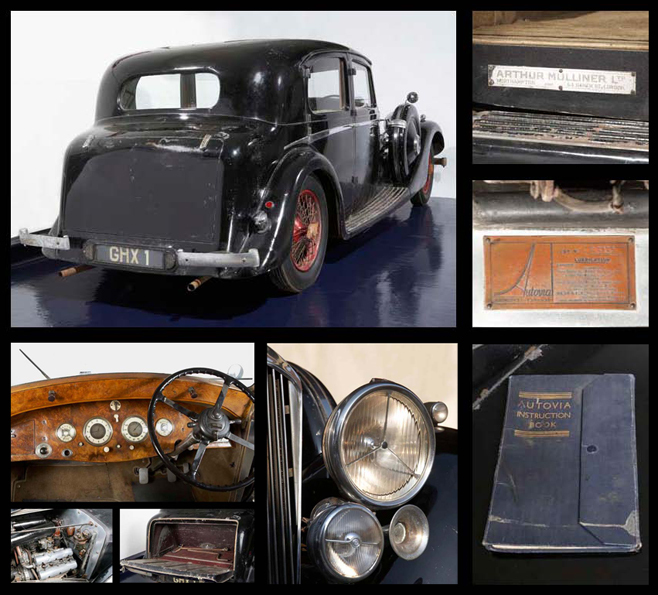 The chassis and engines were usually supplied to coachbuilders to add the body of the customers choosing, Arthur Mulliner being the main one, more on Arthur here - Arthur Mulliner. 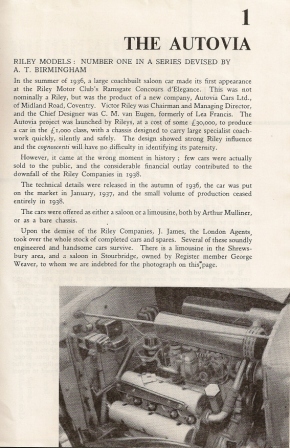 Although it appeared as if they would be a success story, when Riley went into receivership Autovia was considered a Riley asset so it was unable to continue trading and that was the end of what could have been a thriving manufacturer. 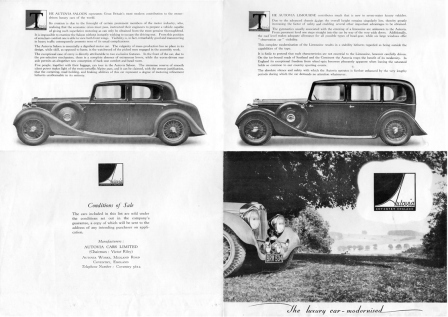 Below, chassis and 2 completed cars, pictures from Dr A.T.Birmingham's book "The production and complete history of the pre-1939 Riley motor cars" which is available to loan from library's or to buy on Amazon, ebay etc. probably the largest gathering since 1938. Below - a limousine and 2 X specials. 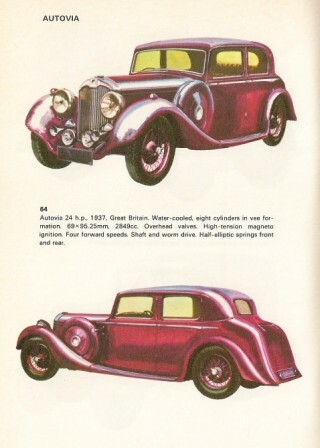 The V8 Autovia saloon, its radiator grille faintly reminiscent of that of the Lea-Francis "Ace of Spades." THE Autovia was conceived from Victor Riley's desire to produce a luxury car. 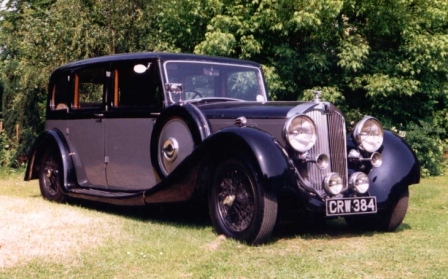 He wanted to keep this apart from the Riley Motor Co.'s products and in 1935 sent Gordon Marshall to ask C. M. Van Eugen whether he would undertake the task. Van Eugen, now retired and living in Stoke Park, Coventry, to whom I talked about the Autovia, came to this country from Holland, when that country was the land of the Spyker. He was with the Daimler Company in 1913 and went to Lea-Francis when that firm was in a bad way in 1923. There he was responsible for the" Hyper" Lea-Francis with which Kaye Don won the 1928 T.T., Delaney encouraging him to re-design the Meadows engine with Cozette supercharger to give the required power output, after experiments with some old non-supercharged cars at Le Mans in 1927 had convinced him that the components would withstand Don's driving to win the Ulster race. In 1930 he designed the single o.h.c. “Ace of Spades" Lea-Francis, after the Southport-built twin-cam 6-cylinder Vulcan version had all but ruined the Company. Perhaps 750 of these were made. A receiver, Charles Turner, was in charge of Lea-Francis from 1931- 35 and during that time Mr. Van Eugen was responsible for everything that went on in the factory. Turner attempted to sell the Company to Riley, but they were only interested in the goodwill, and Harry Rose resuscitated the Lea-Francis in the old Triumph Gloria works, the original works having been taken over by G.E.C., who still occupy it. Van Eugen agreed to work on the Autovia, although no contract, nothing on paper, ever passed between him and Gordon Marshall and Victor Riley. He was given an office in the Riley factory and commenced work with two draughtsmen he brought from Lea-Francis. Victor Riley said, in effect, "We have an engine, develop it," referring to the Riley V8, but all Van Eugen had to work on was the cylinder block of this engine and that was the wrong size. In any case, this engine was suffering from carburation problems and as by this time Harry Rose had left the Riley Company, they were without an engine man to rectify these. Van Eugen set out to build a low-slung, silent-running car that could challenge the 25/30 h.p. Rolls-Royce market. He was entirely responsible for this Autovia, as it was called, even to ordering all the materials and taking cars out on test. In a small shop in the Riley factory three experimental cars were built. A new 90° 3-bearing crankshaft was designed, the biggest task being to apply balance-weights to this shaft within the confines of the crankcase. The solution was found in bolted-on lead-bronze weights filled with lead, and the crankshaft was fully machined. The 90° V8 engine, of 69 x 95 1/4 mm. (2,849 c.c.) had three cam- shafts, the centre one between the cylinder blocks operating the inlet valves and the others the exhaust valves. The famous Riley push-rod valve gear was retained, enabling hemispherical combustion chambers to be obtained without the complication of o.h. camshafts, and the rocker-gear, plugs and cylinder head holding down studs were extremely accessible. Quiet timing gears were obtained by using a gear of high-carbon steel driving a cast-iron inlet timing gear, the exhaust camshaft gears being of phosphor-bronze. A fourth gear carried the fan pulley and provided a drive for the tachometer. 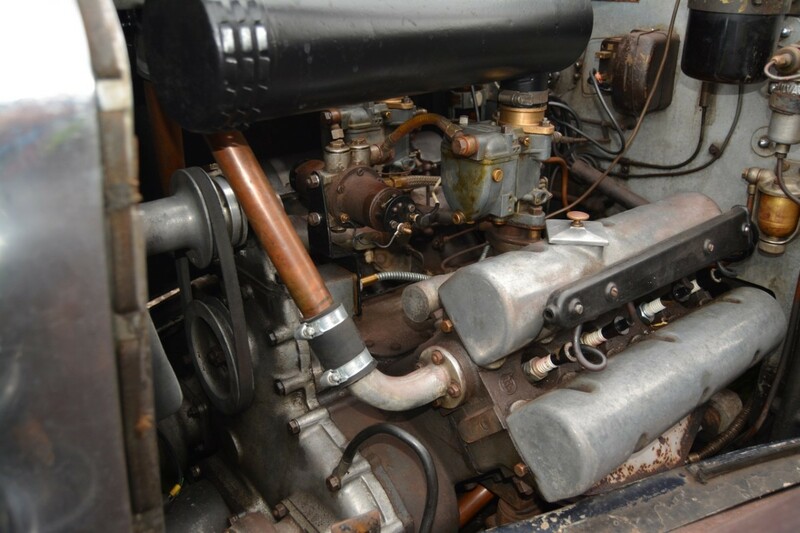 The cylinder heads were new, not those of the successful Riley Falcon, but the Autovia engine was literally two 4-cylinder units united, each block having its own downdraught carburetter, own inlet manifold, own water pump, and own exhaust system. The dynamo was driven directly from the nose of the crankshaft, following Riley practice, and this V8 power unit was 5-point rubber mounted, use being made of Silentbloc bushes. To obtain a low chassis, and thus be able to claim a low floor level with consequent ease of entry and egress and a flat floor free from wells and transmission tunnel, Van Eugen used fully boxed channel-section side-members which passed under the back-axle, the latter being of the worm type. David Brown supplied the underslung worm assemblies, the first deliveries of which were not entirely trouble-free. Other contributions to a floor height of only 21 in. were trunnion spring-mountings in lieu of shackles and a front axle in which the springs passed through square box-type mountings in the axle beam itself. A good lock gave a turning circle of 40 ft. The front compartment was kept clear by using a horizontal r.h. brake lever and a pre-selector gearbox with its steering-wheel control. This gearbox gave four forward speeds, the indirects being either 17.28, 10.05, and 6.63 to 1 or 16.25, 9.46 and 6.23 to 1 depending on whether the 4.86 or 4.57 to 1 axle ratio was specified, Assuming the engine would pull 5,000 r.p.m., the respective maximum speeds were 25, 43, 65 and 89 m.p.h., or 28, 46, 70 and 95 m.p.h. Dunlop " Fort" 19 x 5.5 tyres were fitted. The gearbox was an Armstrong Siddeley and Van Euguen often had to reject half-a-dozen or so before he encountered one sufficiently quiet for his purpose. Torque-tube transmission was employed, with an ingenious vee-forward-mounting on Silentbloc bushes. Van Eugen designed a centrifugal clutch under Newton patents, to give two-pedal control in traffic. 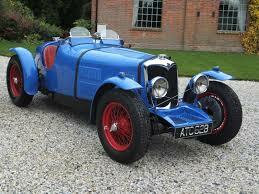 He endowed the Autovia with excellent Girling brakes with magnesium-alloy back plates. Other outstanding features were a 16-gallon rear fuel tank feeding the Zenith Type 36 VI-2 carburetters through an L-type S.U. pump, automatic chassis lubrication and inter-connected Luvax shock-absorbers. Van Eugen, who controlled the entire project, even to making the required jigs and tools, designed a very deep-shell, handsome radiator with thermostatically-controlled shutters, in which a trace of Lea-Francis can be discerned. A move was made to part of a rented Ordnance factory in Coventry and with 30 or 40 men Van Eugen was ready to go into' production. 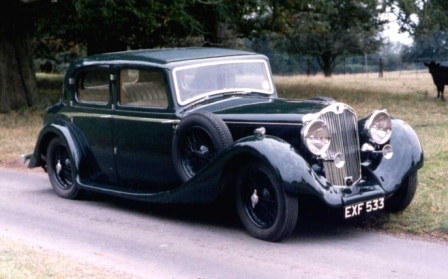 The ultimate aim was about 20 cars a week, in sportsman's coupe, saloon and limousine forms, for which Arthur Mulliner bodies the names "Princess Marina" and "Queen Mary" were coined. The chassis had a wheelbase of 10 ft. 9 in. and cost £685. 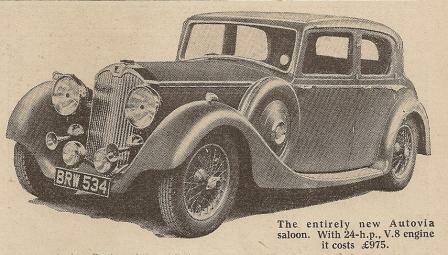 The saloon was priced at £975, the limousine at £995. 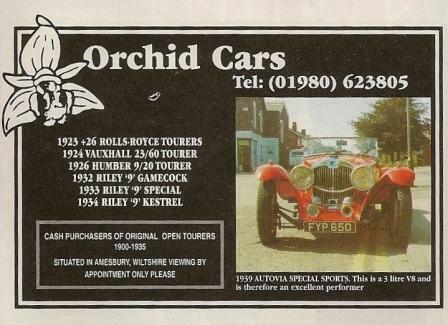 With prices under four figures and very great care taken over sound deadening, these fully-equipped Autovias, or luxury Riley’s, looked like being successful. Van Eugen did his testing locally, eschewing Brooklands, as this was a luxury car. He drove a limousine as his personal car. On the bench at the Ordnance factory the engine gave 97 b.h.p. with silencers and all components in place. The first Autovia made its appearance at the 1936 Ramsgate Concours d'Elegance, eighteen months after Van Eugen had been appointed to produce it, and it took first prize in the £1,000 class. Press road-tests confirmed that the saloon would exceed 90 m.p.h. on Brooklands Track, although Autovia Cars Ltd., whose address was Midland Road, Coventry, were content to claim 80 m.p.h. 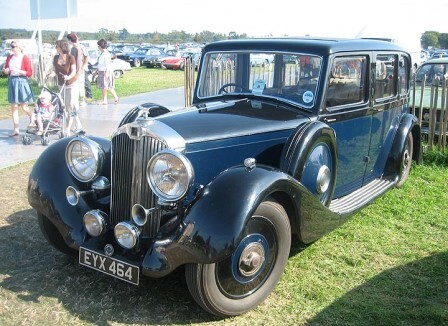 Alas, Riley Motors got into financial difficulties, the Autovia project was moved back to the Riley works and early in 1938, when a receiver was appointed for Riley (Coventry) Ltd., because Autovia Cars Ltd. was an asset it was put into voluntary liquidation. Perhaps 50 cars had been made. Naturally, Van Eugen was broken-hearted. He returned home a disillusioned man, until Sir Miles Thomas sent for him to work for Wolseley Motors Ltd. There he did excellent work, notably in developing the A-, B- and C-type B.M.C. back-axles, as a beautiful little model of one of these axles, presented to him on his retirement, testifies. Just prior to the war he was associated with a Wolseley 25 which was to have had a Cotal electric gearbox built in Birmingham, using Lucas coils in the magnets, under the French licence. Three of these experimental Wolseley’s were built but this was another project killed by the war. Van Eugen, however, still owns the first Wolseley 6/80 to be made. I make no excuse for including these comments on the Autovia in this section of MOTOR SPORT, because I am sure that, confronted with one of these unusual and handsome cars, the V.S.C.C. would accept it as a p.v.t.-W. B. Below, from a 1975 book, "Passenger cars 1924-1942" part of a 7 book series "Cars of the world in colour"
The development from scratch of an out-and-out luxury car of no sporting proclivities was a hazardous undertaking in 1936, yet two British firms attempted it: Rootes with their stillborn straight-eight Sunbeam, and Riley with the Autovia, which actually got into production. Victor Riley was competing directly against the 25-30 h.p, Rolls-Royce, as can be seen from such ideas as annual inspection schemes, and an Autovia chauffeurs' school. The design was entrusted to Charles van Eugen, formerly of Lea-Francis, and a vee-eight configuration was chosen partly on grounds of compactness, and partly because Riley already offered an engine of this type, the unsuccessful 2.2-litre 8-90. 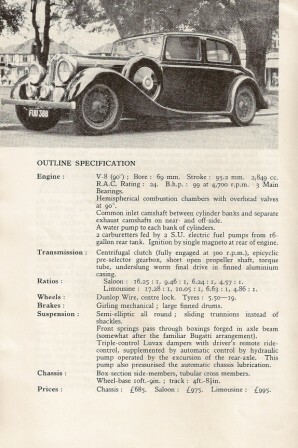 The Autovia unit followed the same lines; the two blocks, set at an angle of 90 degrees, had the bore of the l 1/2-litre and the stroke of the 9 h.p., and were built in the regular Riley fashion with twin high-set camshafts, hemispherical combustion chambers and detachable heads. Ignition was by magneto, and each bank of cylinders had its own downdraught carburetter and water pump. Fuel feed was by twin electric pumps, and output was a useful 99 b.h.p. This engine was mounted in unit with an automatic clutch and a four-speed preselective gearbox as used on smaller Rileys. 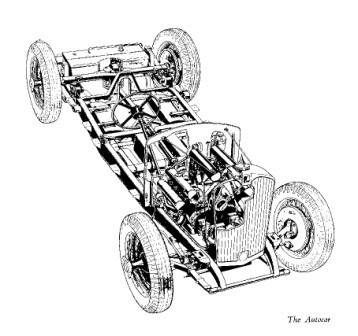 The deep-section underslung frame had five cross-members, the worm-drive back axle was a David Brown product, and the semi-elliptic springs were assisted by hydraulic dampers, with four-position ride control a’ la Rolls-Royce. Other pleasing touches included one-shot lubrication, built-in jacks and windtone horns. 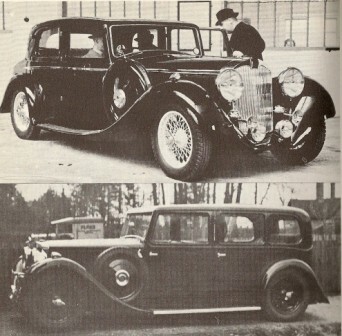 A sports sedan and a limousine were the standard bodies, both by Arthur Mulliner of Northampton. The prices were £975 ($4,875) and £995 ($4,975) respectively. The prototype appeared in the summer of 1936, but production did not get under way until seven months later. On the road, the Autovia combined an excellent ride with sports-car standards of handling, and even on a weight of 4,500 pounds, a speed of 90 m.p.h. was possible. 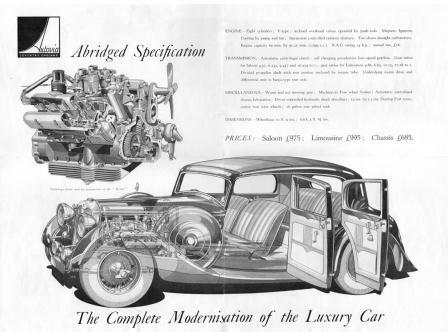 For 1938 an all- synchromesh gearbox was offered as an option. Riley's finances were, however, already in a parlous state, and the new Autovia factory remained empty. 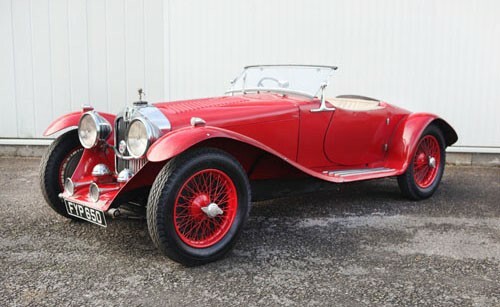 The thirty-odd vehicles that constituted the total production were put together in the main Riley works. When Lord Nuffield acquired the company in the autumn of 1938, unsold Autovias were quietly remaindered off by a London dealer at £550 each. Below - CRW909 sold at auction in 2017 and part of the auction catalogue description (which may not be entirely correct especially the gearbox information, it is almost certain that a preselector gearbox would have been fitted when new, when they decided to offer an optional manual gearbox the ZF unit would have been retro-fitted). CRW 909 is one of only 11 survivors and the only car to have been fitted with a manual gearbox from new. In fact, the gearbox is a ZF unit for which, the story goes, ZF were never paid (the present company is happy with this and discovered recently that the Autovia is the oldest running car in the UK with a ZF gearbox!). This car was tested by Motor magazine for the February 1938 edition, by which time it had already covered 38,000 miles and was tested at 91mph. The car was also loaned to E.R.A. Ltd (whose own products had Riley antecedents) for appraisal and it is believed Raymond Mays held on to it for six months. What happened next is a bit of a mystery and the car suffered the indignity of being used for private hire work in London (Raymond Mays doing a spot of moonlighting?) before being transported to the island of Orkney in 1946. Its recorded mileage at that time was 126,000. It has only covered an additional 1,000 miles since then, but it was carefully stored during that time. The engine was re-built by the previous owner who then passed the car on to the vendor. He showed it at the Riley Register Rally in Coventry this year, the first time it had been back to Coventry since 1946. The vendor has done much work to ensure that the car is in sound running order. He has replaced most of the wiring, fitted a coil conversion, replaced the floors, refurbished the wheels and fitted new tyres and tubes. The sump was removed and cleaned out and the bottom end was checked over and found to be in order. The carburettors were cleaned and adjusted, the fuel tank cleaned out and a new professionally-made exhaust system fitted. 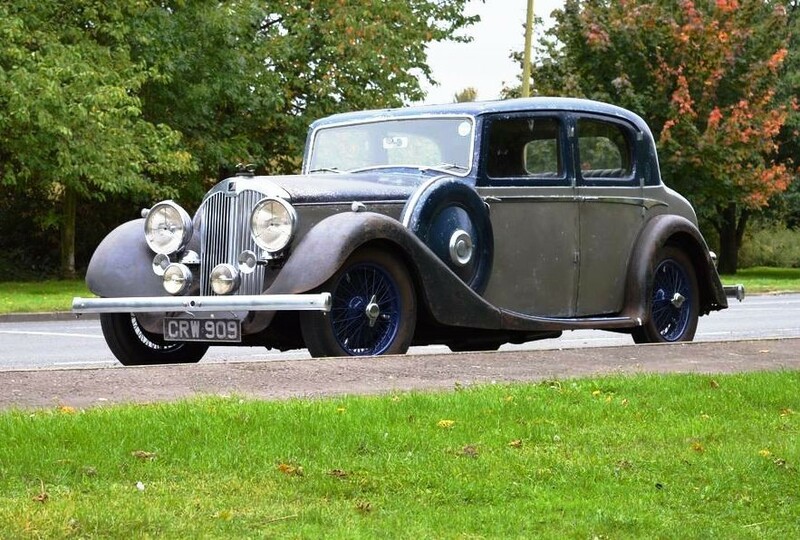 The car is in astonishingly original condition and the Mulliner body is incredibly well preserved, with all the original panels fitting as they should and the doors opening and closing perfectly. The paintwork is original and 'oily rag', and the interior is original with only a few minor repairs. Sadly, the tools boxes are empty but they are velvet-lined! An entirely new all-British motor car was recently announced by a Coventry firm. Known as the Autovia, it represents an interesting contribution to the ranks of England's luxury vehicles, and is sponsored by some of the foremost names in the motor industry. The engine is a high-efficiency overhead valve eight-cylinder unit, rated at 24-h.p., and arranged in the shape of a vee. This form of engine design offers many advantages including exceptional accessibility, small overall length, complete absence of vibration and remarkable silence of operation. The eight cylinders have a bore and stroke of 69 mm. and 92.25 mm., giving a total capacity of 2,849 c.c. Five-point rubber mounting is employed for the engine-gearbox unit, whilst mixture supply is from two downdraught carburetters. Ignition is by means of a vertical magneto, and cooling is, thermostatically controlled. The gearbox is of the pre-selective type, which, in conjunction with the automatic clutch offers one of the most simple and efficient forms of transmission yet devised. A further noteworthy feature is the worm driven back axle, giving the rear passengers a low, seating position combined with generous head room. In its general appearance the car is particularly attractive, and achieves an ultra-modern exterior without recourse to any form of Americanisation. Two models are available: the five-passenger saloon costing £975, and the seven-seater limousine which is priced at £995. The chassis is available at £685. The car is now in production at the new factory of Messrs. Autovia Cars Limited, Autovia Works, Midland Road, Coventry. The Directors are Mr. Victor Riley and Capt. G. E. W. Broade. The general manager is Mr. S. Gordon Marshall, and the London distribution is in the hands of Messrs. Arthur Mulliner Limited, 54, Baker Street, W.I. 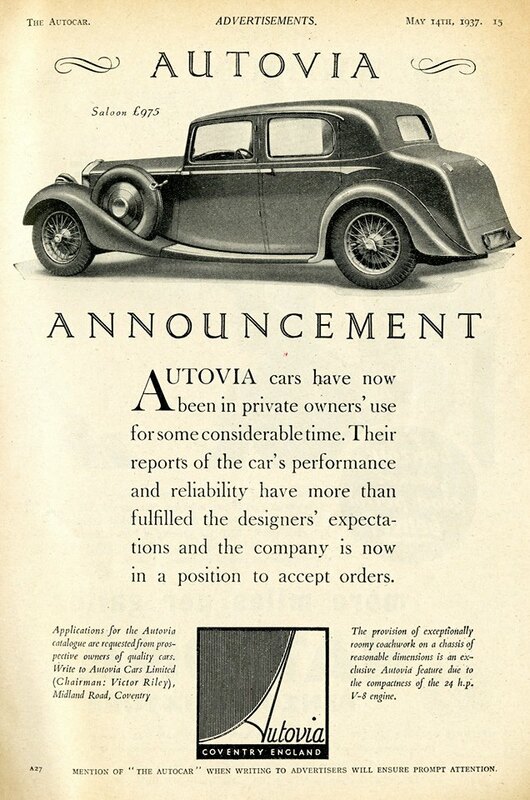 Below - an advert from "The Autocar" magazine 14th May 1937.